Nvidia reports fourth-quarter earnings after the bell on Thursday. Millennials and Wall Street are bullish ahead of earnings, but enthusiasm is waning. The company will have to prove it can grow its businesses that don’t rely on crypto in order to impress investors. Nvidia is set to report earnings after the bell on Thursday. The company has historically been a favourite among young traders and ahead of earnings, millennials on the Stockpile app were buying shares 4.5 times as often as they were selling them, according to data given to Markets Insider. The stock is currently the 17th most held stock on Stockpile’s platform and was the 13th most popular stock as measured by the number of shares traded in the past week. Wall Street is similarly bullish ahead of the results. More than half of the analysts tracked by Bloomberg rate Nvidia a buy ahead of earnings and just 5.7% say it’s a sell. Enthusiasm from the Street might be waning, though. Goldman Sachs removed the stock from its conviction list last week and Citron Research said it would be waiting on the sidelines for a while. Both firms say they are optimistic about Nvidia’s long-term future, but think the company’s red-hot rise over the last year has left its stock price a bit too high. Nvidia is up 16% so far in 2018 and 97% over the last year. Investors will be looking for the company to talk about how the incredible rise in the price of cryptocurrencies impacted the company’s results. AMD reported that one-third of the growth in its graphics business came from increased demand from cryptocurrencies miners. Nvidia likely received a similar boost in the fourth quarter, but whether its a sustainable boost is still unknown. The company will likely have to show growth in its other businesses in order to impress investors. The Wall Street consensus is for adjusted earnings of $US1.29 per share on revenue of $US2.676 billion, according to Bloomberg data. 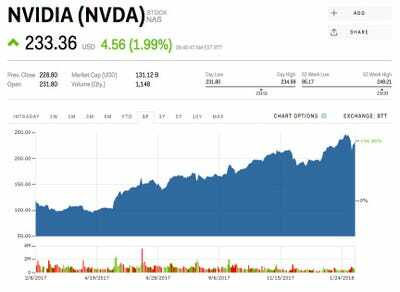 Watch Nvidia’s stock price move in real time here.